Before diving into the topic let us see that active and passive income means. To put it into simple words, active income is where you trade precious you hours for money. Passive income, on the other hand, is where you make money while you sleep. 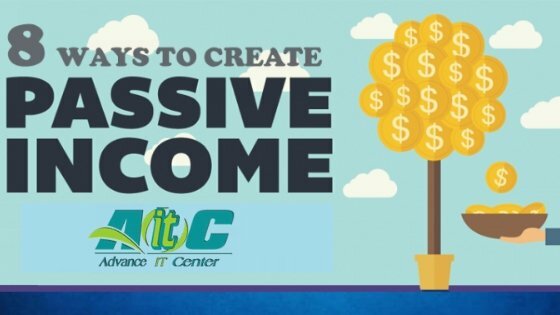 Passive income sounds great right? So let us see how we can save our precious time by building these sources of passive income, instead of trading our valuable time for money by freelancing. Often we create drafts of our work that do not make it to our final work. For example, if you are a freelance photographer, a lot of your photographs will not make it to your client's folder. You can sell those pictures on websites like Shutterstock. This will be a passive income, and you will earn money every time someone purchases that picture off of that website. Even music producers and videographers can gain passively using this method too. Often when writing an article, we need to research the topic. While researching, you can open an Excel file and record the finding your research there. Even these Excel files can be sold, or if not sold, still bring value to you. You can sell them to other freelancers and also use them for yourself in future projects. If you are good at digging up backlinks, you can record which websites provide backlinks and sell that list too. Websites like Fiverr make it easier to sell these kinds of product. As successful freelancer who is in the field for a long time, and has an outstanding portfolio. You will get a lot of projects from a lot of different clients. Hardworking freelancers invest a lot of time in doing all these projects and even stress themselves to meet the deadlines. But as you may have the saying "Don't work harder, work smarter." You may get a lot of projects, but you don't need to do all of them by yourselves. You can delegate a few of those projects to freelancers you trust and give them a part of the revenue for their work. But be careful who you choose to provide the project too because a lousy job will reflect on your profile poorly. Digital products include music tapes, photographs, videos, digital art, infographics and much more. You can even sell images you photoshopped. If you specialize in making WordPress themes, you can generate the right amount of profit selling them too. There are a lot of websites that make selling digital products very easy. They take commissions for selling through their websites, but they have a huge customer base. Which more than makes up for it. Selling digital products is an excellent way to earn passive income. Because once you put them up for sale, they will be up there for a lifetime and multiple people can purchase and use them. If you are a freelancer, you are specialized in a specific field which earns you money. Which means there will be a lot of people wanting to specialize in that field too so that they can earn money also. You can capitalize on this by preparing an online course and putting it up for sale. Right now, selling online courses are a multi-million dollar business. It may be quite tough to formulate a course, but it will be more than worth your while. A good online course usually markets itself, as people share it on social media and suggests it to other people. There are a lot of websites out there like skillshare that helps you sell your course easily. These websites have a huge customer base as well. Again, as a freelancer, you will specialize in a specific field, and there will be people wanting to know how it's done. After the invention of eBook and devices that Amazon Kindle, sales of books have been on the rise again. You can capitalize on this by writing a book about your craft and how you do it. Even if you don't want to share the secrets of your skill, you can always write fiction and non-fiction novels and sell them. There are a lot of writers out there that purely live off of the royalties they earn by the sells of their books. Right now, YouTube holds the biggest audience on Earth. Well informed and well-presented videos spread like wildfire on YouTube. If you have a good sense of humor, you can capitalize on that too on YouTube. There are a lot of ways to earn through YouTube. The most basic way is to run ads on your video. Other than that, you can promote products through paid sponsorship's on your video. You can also include affiliate links on the video description that will generate commission. If you own an online course, you can put a trailer of that on YouTube and drive more traffic to your online course. As a freelance writer, most of what you write will be for either a blog or an affiliate site. If you earn a lot by writing for blog websites, imagine what you can earn by owning a blog of your own. There a lot of ways you can earn through holding a blog. Again, the most basic idea is, of course, to run ads on your blog. If your site gains a good authority, you can sell backlinks from your site. If you own an online course, you can drive traffic there as well. If you have written product reviews as a freelancer, you will know how this works. You promote products from Amazon and other e-commerce stores on your website. For any sale of those products through your affiliate link, you will earn a commission. Although this market is a bit competitive nowadays, it is still an excellent way to make passive income since e-commerce stores are on the rise.